For many people, the perfect July Fourth weekend includes three All-American ingredients: fireworks, a barbecue and a pool party. We share the first two emblems of national identity with the Chinese and the Australians. Only the third, the backyard swimming pool—in John Cheever’s words, “that quasi-subterranean stream that curved across the county”—is indelibly American, a ubiquitous symbol of suburbia. Despite appearances, the swimming pool has been around for millennia. The first known one was built by the Harappans, a civilization based in the Indus River Valley that flourished around 2600 B.C. Dubbed the Great Bath because of its considerable size and technological sophistication, the solid brick pool occupied a focal place in the now deserted city of Mohenjo-Daro in what has become modern Pakistan. Although Harappan script remains indecipherable, archaeologists believe that the Great Bath was used for religious rites and ritual purification. The ancient Egyptians, by contrast, built swimming pools because they loved the sport and thought it was good exercise for the body. So did the Athenians under the laws of Solon, which required every boy to learn to swim. 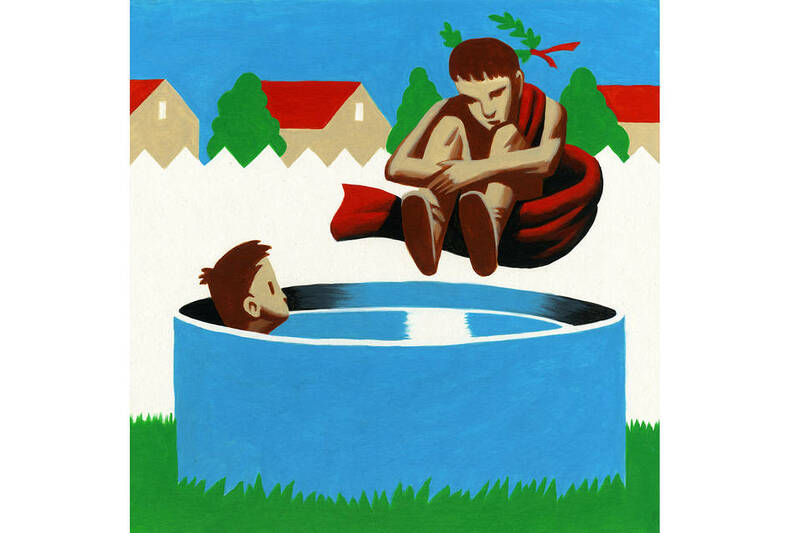 Plato believed that swimming lessons helped teach young people how to be responsible citizens. The Romans stopped thinking about swimming in terms of sport and began building pools simply to have fun. One of Emperor Augustus’s closest friends and advisers, the wealthy Gaius Maecenas (circa 70 B.C. to 8 B.C. ), set the new tone at his magnificent villa on Rome’s Esquiline Hill. A bon vivant and great patron of the arts, Maecenas is believed to have introduced his fellow citizens to the pleasures of Jacuzzi-style pools, heating on demand and drunken swimming parties. The collapse of the Roman Empire in the fifth century was a bad time for swimming-pool construction. Few pools were built again until the 19th century, when a resurgence in the popularity of swimming led to a revival of the public pool. The private swimming pool, however, remained a footnote of history until its rediscovery by Hollywood in 1920 or so. Mary Pickford and Douglas Fairbanks rekindled the fashion by installing a 100-foot-long pool at Pickfair, their Beverly Hills estate. Soon pools became the ultimate status symbol; first for movie stars, then for magnates like William Randolph Hearst and finally for the middle class during the postwar building boom. But before we drain every swimming pool in protest against capitalist decadence, let’s remember what pools have given us: the musicals of swimming star Esther Williams; the best scene from 1967’s “The Graduate,” with Dustin Hoffman, encased in scuba gear, peering at the strangeness of his world; David Hockney’s pool paintings; and—most important of all—some of the happiest memories of childhood.